So I have this thing about surprising Tyler. I don't like him to see me in the process of getting it ready, no matter what the surprise is. This morning, when Tyler's alarm went off I got up. He was still in bed because he sets his alarm earlier than he needs to so he can sleep in a little bit (a habit that definitely made late for many classes in college). I hoped he would think I had just gotten up to use the bathroom and then just not notice that I didn't come back to bed... Maybe he would be out of it enough, right? So I crept into the bathroom and then tried to be so sneaky about quietly opening the other door that leads to the laundry room and kitchen, however, our doors are not very quiet. Once in the kitchen I grabbed the portions I had prepared last night and got to work. When Tyler got up he came in and asked me what I was doing. I thought he might but I couldn't figure out the best thing to say so I just said, ”oh... Just... Nothing.” Right... Very smooth. 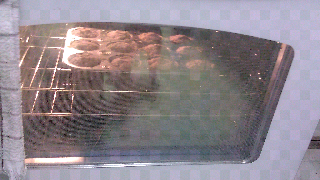 Anyway, I got some blueberry muffins in the oven with enough time for the timer to signal their readiness before Tyler had to leave. Well... Apparently, if you mix the eggs, water and oil in a bowl and mix the crumb topping in another bowl and put them in the fridge over night you will have to add approximately 5 minutes to the cooking time to compensate for the over all refrigerated starting temperature. I know this because they took around 25 minutes instead of the 17-19 listed on the box (I know, it might be surprising to some that I used a box, but it seemed like the easiest easy to not take hours this morning). This was not my plan and it made Tyler late. However, I'm sure they will over look his tardiness when he shows up with a couple muffins for each of them. Besides, Tyler usually gets to work before his brother anyway so I don't think it is a big deal. I wanted to do something extra special to show Tyler I love him and he knows how much my sleep means to me seeing as Dax still wakes me up at least once before 6, sometimes twice, and Luke keeps waking up around 6 (which I don't know what to do about). I know how much he loves muffins for breakfast, particularly blueberry ones, so this seemed like a great way to accomplish my goal. He just sent me a text thanking me and saying they were delicious so I think that means that it was a mission accomplished! I splurged and had one too but I didn't put any butter or anything on it. You don't want to know how many calories just one is worth. It makes me feel like I need to go do some zumba or something. I will not be eating anymore of them though. I tell you that now so I can pretend like this is a way to hold myself accountable. 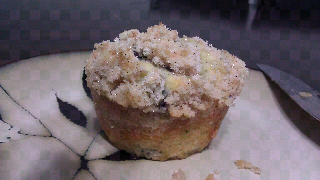 I will be giving a short update tomorrow confirming that I didn't give in to the last 3 delicious looking crumb topped muffins with real blueberries baked in. Scrumptious! Happy 1st of February everyone! Mmmm.... Muffins! Way to be sneaky, Sis! Yum! Those look great! I will have to do something like that for my hubby.